"Plura" redirects here. For other uses, see Plura (disambiguation). 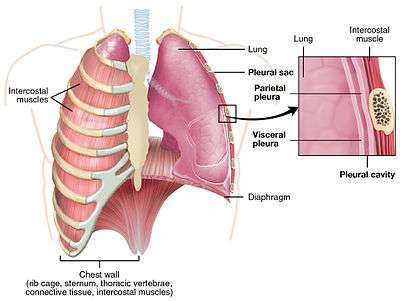 In human anatomy, the pleural cavity is the thin fluid-filled space between the two pulmonary pleurae (visceral and parietal) of each lung. A pleura is a serous membrane which folds back onto itself to form a two-layered membranous pleural sac. The outer pleura (parietal pleura) is attached to the chest wall, but is separated from it by the endothoracic fascia. The inner pleura (visceral pleura) covers the lungs and adjoining structures, including blood vessels, bronchi and nerves. The pleural cavity can be viewed as a potential space because the two pleurae adhere to each other (through the thin film of serous liquid) under all normal conditions. 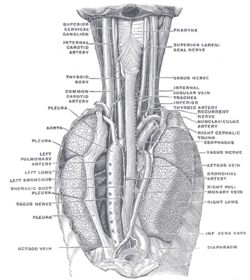 In humans, there is no anatomical connection between the left and right pleural cavities. Therefore, in cases of pneumothorax, the other lung will still function normally unless there is a tension pneumothorax or simultaneous bilateral pneumothorax, which may collapse the contralateral parenchyma, blood vessels and bronchi. The visceral pleura receives its blood supply from the bronchial circulation, which also supplies the lungs. The parietal pleura receives its blood supply from the intercostal arteries, which also supply the overlying body wall. The costal and cervical portions and the periphery of the diaphragmatic portion of the parietal pleurae are innervated by the intercostal nerves. 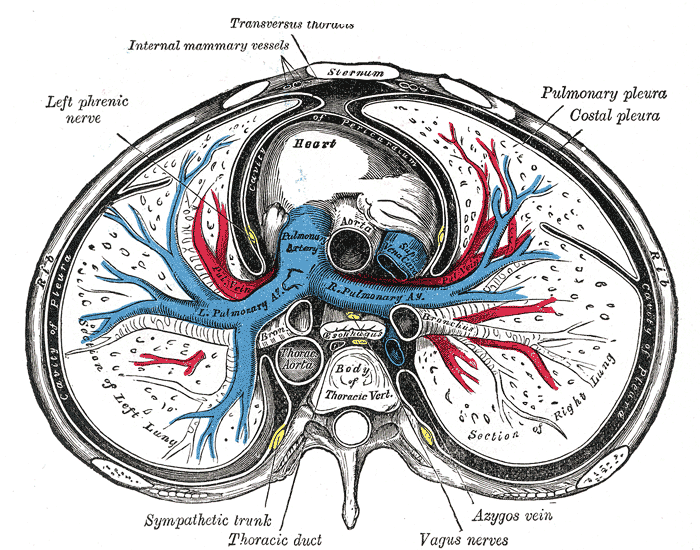 The mediastinal and central portions of the diaphragmatic pleurae are innervated by the phrenic nerves. The visceral pleurae covering the lung itself receive their innervation from the autonomic nervous system and have no sensory innervation. Only the parietal pleurae are sensitive to pain. Initially the intraembryonic coelom is one continuous space. During development this space partitions to form the pericardial, pleural and peritoneal cavities. The diaphragm and the paired pleuropericardial membranes separate the coelomic cavity into four parts. From the splanchnopleura (the visceral mesodermal layer) develops the visceral pleura and from the somatopleura (parietal mesodermal layer) develops the parietal pleura. The pleural cavity, with its associated pleurae, aids optimal functioning of the lungs during breathing. The pleural cavity also contains pleural fluid, which acts as a lubricant and allows the pleurae to slide effortlessly against each other during respiratory movements. Surface tension of the pleural fluid also leads to close apposition of the lung surfaces with the chest wall. This relationship allows for greater inflation of the alveoli during breathing. 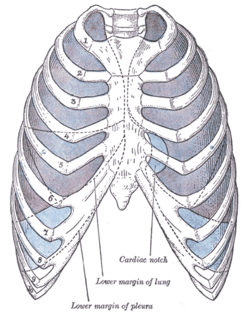 The pleural cavity transmits movements of the ribs muscles to the lungs, particularly during heavy breathing. During inhalation the external intercostals contract, as does the diaphragm. This causes the expansion of the chest wall, that increases the volume of the lungs. A negative pressure is thus created and inhalation occurs. The lung is surrounded by the visceral and parietal pleura, giving rise to the fluid-filled intrapleural cavity. Pleural fluid is a serous fluid produced by the serous membrane covering normal pleurae. Most fluid is produced by the parietal circulation (intercostal arteries) via bulk flow and reabsorbed by the lymphatic system. Thus, pleural fluid is produced and reabsorbed continuously. In a normal 70 kg human, a few milliliters of pleural fluid is always present within the intrapleural space. Larger quantities of fluid can accumulate in the pleural space only when the rate of production exceeds the rate of reabsorption. Normally, the rate of reabsorption increases as a physiological response to accumulating fluid, with the reabsorption rate increasing up to 40 times the normal rate before significant amounts of fluid accumulate within the pleural space. Thus, a profound increase in the production of pleural fluid—or some blocking of the reabsorbing lymphatic system—is required for fluid to accumulate in the pleural space. Pleural effusions are classified as exudative (high protein) or transudative (low protein). Exudative pleural effusions are generally caused by infections such as pneumonia (parapneumonic pleural effusion), malignancy, granulomatous disease such as tuberculosis or coccidioidomycosis, collagen vascular diseases, and other inflammatory states. Transudative pleural effusions occur in congestive heart failure (CHF), cirrhosis or nephrotic syndrome. Localized pleural fluid effusion noted during pulmonary embolism (PE) results probably from increased capillary permeability due to cytokine or inflammatory mediator release from the platelet-rich thrombi. When accumulation of pleural fluid is noted, cytopathologic evaluation of the fluid, as well as clinical microscopy, microbiology, chemical studies, tumor markers, pH determination and other more esoteric tests are required as diagnostic tools for determining the causes of this abnormal accumulation. Even the gross appearance, color, clarity and odor can be useful tools in diagnosis. The presence of heart failure, infection or malignancy within the pleural cavity are the most common causes that can be identified using this approach. Clear straw-colored: If transudative, no further analysis needed. If exudative, additional studies needed to determine cause (cytology, culture, biopsy). Cloudy, purulent, turbid: Infection, empyema, pancreatitis, malignancy. Pink to red/bloody: Traumatic tap, malignancy, pulmonary infarction, intestinal infarction, pancreatitis, trauma. Green-white, turbid: Rheumatoid arthritis with pleural effusion. Green-brown: Biliary disease, bowel perforation with ascites. Milky-white or yellow and bloody: Chylous effusion. Milky or green, metallic sheen: Pseudochylous effusion. Viscous (hemorrhagic or clear): Mesothelioma. Anchovy-paste (or 'chocolate sauce'): Ruptured amoebic liver abscess. Microscopy may show resident cells (mesothelial cells, inflammatory cells) of either benign or malignant etiology. Evaluation by a cytopathologist is then performed and a morphologic diagnosis can be made. Neutrophils are numerous in pleural empyema. If lymphocytes predominate and mesothelial cells are rare, this is suggestive of tuberculosis. Mesothelial cells may also be decreased in cases of rheumatoid pleuritis or post-pleurodesis pleuritis. Eosinophils are often seen if a patient has recently undergone prior pleural fluid tap. Their significance is limited. If malignant cells are present, a pathologist may perform additional studies including immunohistochemistry to determine the etiology of the malignancy. Chemistry studies may be performed including pH, pleural fluid:serum protein ratio, LDH ratio, specific gravity, cholesterol and bilirubin levels. These studies may help clarify the etiology of a pleural effusion (exudative vs transudative). Amylase may be elevated in pleural effusions related to gastric/esophageal perforations, pancreatitis or malignancy. Pleural effusions are classified as exudative (high protein) or transudative (low protein). In spite of all the diagnostic tests available today, many pleural effusions remain idiopathic in origin. If severe symptoms persist, more invasive techniques may be required. In spite of the lack of knowledge of the cause of the effusion, treatment may be required to relieve the most common symptom, dyspnea, as this can be quite disabling. Thoracoscopy has become the mainstay of invasive procedures as closed pleural biopsy has fallen into disuse. Pleural effusion: a fluid accumulation within the pleural space. Pleural tumors: abnormal growths on the pleurae. ↑ Light 2007, p. 1. ↑ Widmaier, Eric P.; Raff, Hershel; Strang, Kevin T. (2006). Vander's human physiology : the mechanisms of body function (10 ed.). Boston, Massachusetts: McGraw-Hill. ISBN 978-0072827415. ↑ Porcel, J.M. ; R.W. Light (July 2008). "Pleural effusions due to pulmonary embolism". Current Opinion in Pulmonary Medicine. 14 (4): 337–42. doi:10.1097/MCP.0b013e3282fcea3c. PMID 18520269. ↑ Shidham, Vinod B.; Atkinson, Barbara F. (2007). Cytopathologic diagnosis of serous fluids (1 ed.). Philadelphia, Pennsylvania: Saunders Elsevier. ISBN 978-1416001454. ↑ De Mais, Daniel. ASCP Quick Compendium of Clinical Pathology, 2nd. Ed. ASCP Press, Chicago, 2009.